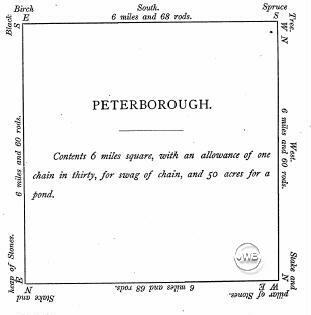 " Peterborough, County of Hillsborough, latitude forty-two degrees, fifty-two minutes, longitude seventy-two degrees, three minutes, is situated in the southwestern part of the county, bordering on Cheshire County, and lies in an amphitheatrical form, with the Monadnock and the large elevated ride of land north of it on the west, the Pack Monadnock and its range, extending through Sharon to New Ipswich, on the east. The village is situated on the Contoocook [River] not far from the center of town, and is the place where these opposite sides converge." At a meeting of the Great and General Court of Massachusetts, assembled Dec. 5, 1737, Samuel Heywood and others [of Hopkinton] petitioned that court "that they might be granted a tract of land on the Souhegan River (PDF) for a township." In 1735 that court voted them "a township of six miles square." On January 16, 1738 Gov. Jonathan Belcher signed an act empowering them to survey the land. Joseph Wilder was selected as Surveyor, and Joseph Richardson and Zacheus Lovell as Charimen, to run the lines around the grant, north-east from the "great Monadnock Hill." The surveyors reported back to the Legislature on May 21, 1738. The General Court approved the survey and authorized Jonathan Prescott to call the first meeting of the proprietors, which he did on 25th of July, 1738 at the public house, or tavern of Luke Verdy, in Boston. By 29 Nov 1738 "it is evident that [these] four men (Hill, Fowle, Gridley and Prescott) had become proprietors of all but two lots in the township -- at that meeting a committee was appointed to "view" the township and to lay out "the town lots." This committee consisted of John Hill, John Fowle Jr. , Jeremiah Gridley, Jonathan and Peter Prescott. The names of the first settlers [from several sources] included William Robbe, Alexander Scott, Hugh Gregg, William Gregg, Samuel Stinson, William Robbe, William Wallace, and William Mitchell. "No permanent settlements took place until 1749... Of the party that came in 1739, all were probably driven away, by fear of the Indians, before any considerable clearing had been made... In 1742, a party of five, came from Lunenburg and cleared a small patch of land near the old meeting-house...they abandoned the settlement at or before the alarm of the war in 1744" [i.e. French and Indian War] and it was not resumed until the peace of 1749. "Another attempt was made before 1744 by William Menee, John Taggart, and William Ritchie," who left and returned in 1749 or 1750. Another account states that Capt. Thomas Morison and a Mr. Russell came to the town as early as 1744. The first child born in Peterborough, was not born until Feb. 22, 1751. Some believe that Peterborough received its name in honor of the Earl of Peterborough, however there is no documentation to prove same. "In a certain deed to Lieut. John Gregg, of the farm C, by John Hill Dec. 6, 1743, it is described as 'East Monadnick'." It is first recognized in their records by the name of Peterborough, at their first meeting held in Peterborough, Sept. 22, 1753. A former historian of the town insists that it was named after one of the town founders, Peter Prescott. The settlement went on prosperously up to 1759. The town was officially incorporated Jan. 17, 1760 within the Province of New Hampshire, granted by George the Second, King. The first meeting was called by Hugh Wilson, authorized to do so in the charter. The meetings of the town after this organization have been held continuously to the present, with the exception of one in 1770 and the other in 1840. Many of the early settlers were of Scottish or Irish origin. Families from Lunenburg, Mass. and Londonderry, N.H. can be found in the lists off the early settlers [in addition to the list above, which included]: William Ritchie, Dea. William McNee, Dea. William McNee Jr., Joseph Caldwell, John Taggart, Gustavus Swan, William Stuart, William Smith, Samuel Miller, Thomas Cunningham, Alexander Scott, James Robbe, John White, John Morison, Jonathan Morison, Capt. Thomas Morison, John Smith, Dea. Timothy Davison, Thomas Turner, Dea. Samuel Mitchell, William Scott, William Mitchell, Rev. Mr. Harvey, Samuel Stinson, William Robbe, Samuel Todd, Dea. Samuel Moore, John Ferguson, David Bogle, James McKean, Jotham Blanchard, Maj. Samuel Gregg, Lieut. John Gregg, Hugh Wilson, Jotham Blanchard, William McCoy, George McClourge, Thomas McCloud, Capt. David Steele, Samuel Miller, Joseph Hammill, Maj. Robert Wilson, Dr. John Young, Samuel Brackett, Thomas Little, Abraham Holmes, Abel Parker, Elijah Puffer, and others. Originally, "their dwellings were miserable huts, not a board upon or within them till 1751, when three frame-houses were erected." The first meeting-house "which must have been erected as early as 1752 or '53 for several years was furnished with no other seats than rough boards laid loosely upon square blocks of wood." "The first use made of our water-privileges was for a saw and grist-mill. . . built by Jonathan Morrison in 1751 for William Gordon, of Dunstable, Mass." In 1788 "a small portion of the town situated on the south-east corner. . . and on the east side of the mountain, was set off to Temple..." In 1791 when Greenfield was chartered, lots one to six were added to that town. "In consequence of the Resolution of the Continental Congress, and to show our determination in joining our American brethren in arms, in defending the lives, liberties, and properties of the United Colonies, We, the subscribers, do hereby solemnly engage and promise, that we will, to the utmost of our power, at the risque of our lives and fortunes, with ARMS oppose the hostile proceedings of the British fleets and armies against the United Colonies." The first house for public worship was erected in the year 1752. It is first mentioned after incorporation in 1761, when "sixty-eight pounds were voted to repair the meeting-house from falling trees and fire." In 1774 it was voted "to build a new meeting-house" but that house was not raised until 1777 and finally finished in 1779. "The first store opened [in Peterborough] in 1771...The first clothier's shop, for taking in wool to card and cloth to dress, was built by William Powers, in 1780, and this was the only factory in town till 1793; when, a wooden building . . . was erected by Samuel Smith . . . and included a paper-mill, a saw-mill, an oil-mill, a clothier's shop, a trip-hammer shop, a wool-carding machine, and a dwelling house." The first school house was probably erected around 1790, when the town was divided into five districts and "provision made for the erection of five buildings." The first post office was established with the appointment of John Smith [as postmaster] on Oct. 1, 1795. The "Peterborough Social Library" was established in 1811. The Peterborough Social Library "became gradually neglected, and was sold about 1830. The Peterborough Town Library was established in 1833, and was, "without doubt, the first free public library in the United States." Three cemeteries were established in the town since its settlement, the Old Cemetery, the Village Cemetery and the Pine Hill Cemetery. SEE Cemeteries under the "Genealogy" section of this web site. In addition there are several small "family" cemeteries and gravesites. In addition to the above, a few burials were made in a little graveyard on the meeting-house hill. William Stuart, the first person who died in town, March 15, 1753, aged thirty-three years was buried here, and then five other burials (which have stones) took place, and a few mounds and head-stones indicate a few graves beside. "A spot was selected near, situated on the side of the hill, east of the meeting-house of about one and a half acres, and walled in for this purpose which is now known as the Old Cemetery." The first burial in this yard was Samuel, son of Capt. Thomas and Mary Morison, died Dec. 22 1754, aged one year; and then burials occurred there until 1834, upon the establishment of a new yard. Village Cemetery was established in the town meeting of April 8, 1834 "that the town take one acre of land on the north end of the new graveyard." Peterborough Savings Bank was incorporated in 1847. It was organized in 1859 by John H. Steele, William Follansbee, Timothy K. Ames, Whitcomb French, James Scott, Albert Smith, Daniel B. Cutter, Samuel Nay, Abraham P. Morrison, Abial Sawyer, Norton Hunt, and Samuel Adams, as board of trustees. The first newspaper in town was published by William P. and John S. Dunbar in the latter part of 1829 and called the Hillsboro Republican and New Hampshire Clarion. It closed April 29, 1831. The second paper [in pamphlet form] called the Peterborough Messenger, was published by Samuel P. Brown in the summer of 1847 and discontinued after about 10 months. The first number of the Contoocook Transcript, published by John R. Miller and Kendall C. Scott was issued June 2, 1849 with four hundred subscribers. It was been continued uninterruptedly to this time, the present proprietors having early changed the name to that of The Peterboro' Transcript. The first town hall was built in 1830. Previous to this time all town meetings had been held in the meeting-house. It was built on the Mitchell Flat on Lot No. 5. At a meeting of the town March 13, 1860 it was voted to build a town-house, and it was erected in 1860. 1831 Joseph Noone's Sons Company created, at one time was the sole source of felt for the U.S. Bureau of Printing and Engraving (used to engrave printed currency). On 9 April 1833 Peterborough NH citizens voted to accept Unitarian minister Abiel Abbot's 499 books and tax themseles to establish a free lending library. All town residents could freely share in this knowledge, and the public library was born. In 1837 a building was erected to serve as the Peterborough Academy. In 1888 it was bought by the town, but delegated to the Aaron F. Stevens Post 6, G.A.R. to serve as their hall. After 1917 it became the headquarters of Wm. H. Cheney Post No. 5 of the American Legion. The soldier's monument originally placed in Putnam Grove in 1869 was removed to the front of this building. Brigham Young (of the Mormon aka Latterday Saints) was in Peterborough NH in 1844 when he received the news that Joseph Smith had been killed. The immediately left and returned to Nauvoo, Illinois. Reportedly 136 citizens of Peterborough and surrounding area followed him there (including Washington and Susannah Taggart) and later to Utah. According to "New Hampshire: A Guide to the Granite State, page 219: "A Peterborough girl became his thirteenth wife...."
The Town Clock was purchased in 1856 and erected in the tower of the Congregational Church. On May 3, 1856: "Voted, That the town purchase a fire-engine and the necessary apparatus for the extinguishment of fires." Prior to this the only means of extinguishing fires was a large fire-engine belonging to and attached to the Phoenix Factory, and a smaller one belonging to the Union Manufacturing Co.
Pine Hill Cemetery was established in 1867 after it was found that all the lots in the Village Cemetery were taken up. The cemetery contained about forty acres. By 1870 in addition to textile goods, piano stools, machinery, precision instruments, wrapping paper, and lumber were produced in the town. About 1870 Peterborough started to become a summer resort destination with four hundred visitors each summer. The Sesqui-Centennial celebration (150th) was held at Peterborough, NH on 24 October 1889. The honorary committee for that occasion consisted of: Frederick Livingston, John H. Morison, William S. Treadwell, Jesse Upton, Theophilus P. Ames, Alvah Ames, John Little, Samuel R. Miller, Nathaniel H. Moore, Daniel B. Cutter, Asa Davis, Amzi Childs, Thomas Little, Nathan B. Buss, Sargent Bohonon, and Samuel Converse. New Hampshire's first state park was created in 1891 when Charles F. Melendy and Austin A. Spofford deeded a three-acre tract of land on the summit of South Pack Monadnock to the state. The following year the park was dedicated in memory of General James Miller, a hero of the Battle of Lundy's Lane in the War of 1812. The Peterborough Town Library was designed by resident George Shattuck Morrison, a nationally renown bridge engineer, in 1892. Morrisons straightforward design, with an emphasis on function and long-lasting materials such as brick and iron, was augmented with a Classical Revival portico in 1914, at the bequest of his sister. Established in 1833, Peterborough is credited with being the oldest free library in the world supported entirely by public funds. [from NH State Register of Historic Places]. The American Guernsey Cattle Club was organized in 1877, and its office was moved to Peterborough NH in 1894 when Peterborough resident, William H. Caldwell, became the club's secretary. The Peterborough Civil War Monument (a bronze statue of a soldier) was designed in 1869 by Martin Milmore, Esq. of Boston and produced in the Ames Foundry of Chicopee MA. The pedestal is of Concord Granite, designed at Chicopee and wrought by D.C. Hutchinson of Manchester NH. The face of the granite pedestal contains a bronze memorial tablet with an inscription of those from Peterborough who died during the War of the Rebellion (Civil War). It was originally installed in Putnam Park in June of 1870. The monument was moved to its present location in 1902 (the new location was originally the Peterborough Academy, then occupied by the GAR and currently the home of the American Legion). This monument is detailed in "Dedication of the Soldiers' Monument at Peterboro', N.H. on Friday, June 17th, 1870." In 1907 Mrs. Marion Griswold (Nevins) MacDowell transferred the deed of the Peterborough property to a newly-created Edward MacDowell Association to honor her husband. A large studio was built, and the first resident artists, Helen and Mary Mears, sisters, moved in. This was the beginning of the reknown MacDowell Colony. Edward MacDowell died January 23, 1908. The Out-Door Players was launched in 1912 by Marie Ware Laughton at a location on the Middle Hancock Road. A summer school camp, special lectures, and summer plays were presented for many years, with Boston University offering a credit certificate. Later it was operated by the Norfleet Camp. The Sargent Camp for girls was established in 1912 by Dr. D.A. Sargent of Harvard and was situated just outside of Peterborough, on about 250 acres bordering on Half Moon Lake. Used from June to September by students in the Sargent School for Physical Education, and had an average attendance of 350. The use changed in July and August when it was used as a junior and senior recreational camp for girls. [Of this list the following men died in service: William H. Cheney, Carroll D. Harpell, David John, and Edward F. Greene]. The Peterborough Historical Society building was erected in 1917 by Mrs. Perkins Bass, and endowed by her with the sum of $50,000. (from A Good Town to Live In, 1926). After the old Town House was destroyed by fire, a new one was built, completed in 1918, at a cost of $75,000. Architects Little & Russell designed the building after the famous Fanueil Hall of Boston. (from A Good Town To Live In, 1926). Originally called Four Wind Farm, Mariarden was started in 1920 by Mrs. Marie Glass (Burress) Currier, a former actress who married lawyer Guy Wilbur Currier in 1894. a summer theatre and school directed by Mrs. Guy Currier, offering classes in drama and dancing. The season ran through July and August. According to "The Bones of the Earth," by Howard Mansfield, page 148, "Bette Davis began at Mariarden. Her mother had brought her to Peterborough, but she could not afford the tuition at Mariarden, so she enrolled her daughter at the Out-Door Players. Davis was discovered dancing there and given a full scholarship to Mariarden. She performed in As You Like It, A Midsummer's Night Dream, and many dance productions." Prior to 1923 residents of Peterborough and surrounding towns traveled twenty miles for the use of the hospital. Through the generous gift of his former home and grounds by Robert M. Parmelee, and their reconstruction by Mrs. Elizabeth Cheney and Mrs. Carl Kaufmann, the town had "The Peterborough Hospital." During the first year of its operation, there were 274 admission, of which half were surgical cases (from A Good Town to Live in, 1926). The hospital was renamed Monadnock Community Hospital before 1948. Peterborough War Memorial: In 1924 an ornamental gateway was created to cover the entrance to the park between the Town House and the Peterborough Historical Society. It was erected by subscription ($10,000). A bronze tablet bearing the names of 113 men of Peterborough who answered the call during World War I. (from A Good Town To Live In, 1926). The Peterborough Players was founded in 1933 by Edith Bond Stearns, who purchased the Hadley family farm. The town was a model for the play, Our Town, written by Thornton Wilder while in residence at the MacDowell Colony, and premiering in 1938. His fictional town of Grovers Corners appears to have been named for Peterborough's Grove Street. "You come up here on a fine afternoon and you can see range on range of hills -- awful blue they are, ...And of course, our favorite mountain, Mount Monadnock's right here ... and all around it lie these towns -- Jaffrey, 'n East Jaffrey, 'n Peterborough, 'n Dublin, and there, quite a ways down, is Grover's Corners. Yes, beautiful spot up here." 1941-1945. From December 1941 to Sep 2, 1945 the United States of America was fighting on two fronts, Europe and the Pacific, during World War II. Peterborough sent its young people to war. 1945 The Annual Report of the Town of Peterborough acknowledged those lost during WW2: John P. Armstrong, Theodore Clement, Roy F. Davis, Charles I. Lindsey, Patrick McLaughlin, Leonard A. Merrill Jr., John F. Moriarty, Donald F. Mulstay, Theodore C. Reynolds (MIA), Hugh E. ROberts, Philip Sangermano and Robert L. Wilder. 1946. New Hampshire Ball Bearings company founded in Peterborough, NH. NHBB was purchased in 1985 by the global manufacturing conglomerate, MinebeaMitsum. The company operates three manufacturing facilities in the US and employs over 1,500 workers. 1972: The National Cash Register Company announced plans to build a $2.5 million plant here. 1973: Founded in NH in 1965 Brookstone opens its first location in Peterborough NH. 1980: Shieling Forest was a gift to the State of New Hampshire by Mrs. Elizabeth Yates McGreal, a long time resident of Peterborough NH and a nationally known writer. The forest is 47 acres with hiking paths and home to the Wildflower Garden, along with a learning center, and is operated by the Division of Forests and Lands of the New Hampshire Department of Resources and Economic Development. In 1985 Jim Grant and his wife Lillian start a company called Jim Grant Associates in their home, focusing on educational conferences and seminars. The name changed to SDE (Staff Development for Educators) and was located at 10 Sharon Road in Peterborough. Highights for Children acquired SDE in 1991. In 2016 the founder Jim Grant died. The company is slated to move to Portsmouth NH in April 2018. In 1987 Connell Communications, a privately held company that publishes trade journals was formed by Thomas James "Jim" Connell. Headquarters at 86 Elm Street in Peterborough.